The NHS needs many more doctors, nurses and staff. Doctors need to work fewer hours each week for rest and family responsibilities and so that they have the time to catch up on the latest developments in their field. Instead, the Tories insist on imposing a new contract that will force junior doctors to work more weekends and receive less pay for doing so. (Junior doctors are all hospital doctors who have not been certified in their specialty, thus becoming consultants. Doctors are categorised as “junior” for many years.) Needless to say, the junior doctors have emphatically rejected the Tory demands and have organized a series of quickie strikes. 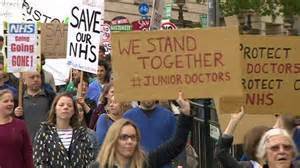 In organizing these militant actions, the junior doctors have brought into the public discourse a wide-ranging critique of the NHS. The junior doctors have gone well beyond the immediate issues at hand. They have pointed out that doctors working long hours become fatigued and provide lower quality care. In addition, they have called for a reversal of the creeping privatization put into place over the last two decades. As socialists, we support the junior doctors unequivocally and wholeheartedly. Beyond this, we call for a massive increase in funding for the NHS. We need to double the number of doctors and staff, so that all health care workers have a work week of less than forty hours, along with long vacations. With an aging population, the demands on the health care system will be constantly increasing, another reason more doctors, nurses and technicians are needed. Creating a NHS that can deliver quality health care will be an expensive project, but the funds are there, hidden away by the wealthy few in tax havens. Until now, the junior doctors have fought Westminster without receiving any help from other unions. Unison and UNITE both have a major presence in the health care system. Yet neither have taken any steps to support the doctors on strike. Members could have been encouraged to join the picket lines. Mass rallies could have been called, sponsored by all of the unions represented in NHS, demanding that the government abandon its efforts to impose a contract. During the two day strikes called by the junior doctors, other workers could have refused overtime and worn big badges with the slogan “we support the junior doctors.” There were many ways that the mainstream unions could have acted in solidarity with the striking doctors, and yet nothing was done, thus demonstrating once again how feeble and ineffectual the union bureaucracy has become. Since health care is a devolved area of concern, the current dispute has not extended to Scotland. Still, the basic problems in the health care system exist here as they do elsewhere in the UK. The Scottish NHS is underfunded, doctors are pressured into working long hours and patients find it difficult to get an appointment when needed. The junior doctors in Scotland could be the starting point for an anti-austerity coalition that included other health care workers and the public at large. Such a coalition could push forward the demand that the government, that is the SNP, drastically increase the funding for the NHS, while providing for the training of many more doctors and nurses. The junior doctors have carried on their struggle without the support of the official unions or the mainstream politicians. Nevertheless, their energy and enthusiasm has been remarkable and morale remains high despite a recent attempt to undermine the strikers’ position. Immediately prior to the last strike, the Labour Party health spokesperson offered a “compromise” by which the government’s plan would be given a trial run in several hospitals to see if it “worked.” Such a deal would have represented a major defeat for the junior doctors, who have emphatically rejected the government’s plan. In the end, the Tories rejected the deal, eager to continue their policy of total warfare on the working class, and the strike continues. When Corbyn was elected Labour Party leader, we were promised a different party, one that would stand with the working class in defeating austerity. Instead, the Labour Party remains as before, unwilling to challenge the system and ready to capitulate when the going gets tough. The Labour Party proposed deal was issued as a public statement co-signed by the Liberal Democratic and SNP health spokespeople. In a dispute that is limited to England and Wales, the SNP goes out of its way to intervene in such a way as to undermine the cohesion and spirit of the junior doctors. This would seem to be a further effort by the SNP to forge an electoral alliance with the Labour Party, but one can only wonder if the SNP is also preparing to introduce some version of the Tory proposal in Scotland. The British Medical Association apparently signed up to the proposed deal. A small professional association, the BMA has been taken over by the junior doctors who have used it as an organisational framework within which to build a grass roots network of activists. It is doubtful that the junior doctors would have approved the proposed deal if it had been accepted by the government. In any case, the willingness of the BMA leadership to sign up to the deal indicates that even here the rank and file need to maintain control over their officials. Neither mainstream parties nor mainstream unions can be trusted. Only militant grass-roots activism can effectively challenge the government and the corporations to reverse the downward spiral of the last period. The strike of the junior doctors could provide the spark for a broadly based movement to reverse the cuts while also presenting positive alternatives. Such a movement could block further cuts, but as long as we are mired in a capitalist market economy dominated by a wealthy few the system will be rigged against us. Breaking with this system through a democratic socialist transformation of society is an essential prerequisite for a just society in which quality health care for all becomes an urgent priority and not just an illusory slogan. The point about the TU beauracracy isn’t especially that they’re “weak and feeble” tho they probably are, so is the rank and file for that matter.The point is that if other unions were to show active, public support and solidarity, they’d be breaking the anti union laws. So they have to decide whether to take the risk of being taken to court and sequestrated or not. Do you know for sure that ” nothing was done” to help? In my experience, good, class,conscious trade unionists ( and there are still Lots of them) do offer help such as money, office facilities, circulating information, photocopying, going on marches ( there have been loads of marches for the NHS over the last few years, with thousands of people on them, not only junior doctors) but tactically the trade unionists who have undoubtedly been on these marches, haven’t publicly called for a general strike in support of the junior doctors, as far as I know.